I have another "green" activity from the Green Expo we attended this past weekend. 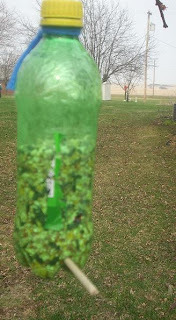 My youngest son is extremely proud of his little bird feeder he "made". I love activities and crafts that serve a purpose. This bird feeder fits the bill- in more than one way! Recycle an old bottle. We used a soda bottle, but water, juice, and liter bottles work too! Yes, I did just hang a preposition at the end of that sentence. Wash and dry your bottle. Have an adult use an exacto knife or sharp blade, or you could use a drill with small bits. CAREFULLY, put small holes in the bottom of your feeder. I am still nursing a stab wound from my first attempt at this. I had the best luck using scissors and bending the plastic to start the hole. This will be the place you insert a dowl for a perch. Insert your dowel. Use a funnel or rolled piece of paper to fill your bottle with seed. Next, tie on your string at the neck of the bottle. You will use this to hang your feeder. Make sure it's secure and strong enough to withstand a little wind. You will need to have an adult finish the feeder by CAREFULLY cutting or drilling holes above the perch. This will be where the birds will peck at their food. If you have sunflower seeds or large niblets, make sure the holes are large enough for it to pass through. FINALLY, you are ready to find a spot to hang your feeder. We hung ours on the old maple trees that shade our house. I know the sparrows are going to enjoy these new treats. What type of birds frequent your feeders? Hello, just wanted to say, I liked this post. It was inspiring.